At Ellerslie Vet Clinic we enjoy complicated medical cases like Cushing and we are skilled at helping you navigate the best approach for your furry friend. 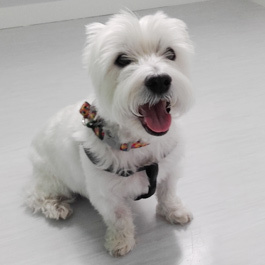 We recently had handsome 11 year old West Highland Terrier Mac visiting us. Mac was here for an ultrasound of his abdomen and Dr Kathrin noticed specific changes to the morphology of Mac’s liver together with some changes in his blood: Specific liver enzymes were elevated amongst other changes. Kathrin suspected Cushing ’s disease and after performing further tests could prove that Mac actually does have Cushing ’s. Cushing ’s disease is a very complicated disease with a wide range of symptoms. Plainly spoken one could say the adrenal glands (two small glands located next to the kidneys in the abdomen) are producing excessive amounts of Cortisol, which is a hormone helping to regulate the body’s metabolism. Cortisol is released from the adrenal glands at times of stress to prepare the body for a flight or fight response. ACTH is the superior hormone, which is produced in the pituitary gland (at the base of the brain) and which controls the production and release of Cortisol from the adrenal glands. The Cortisol level in the blood of healthy animals varies a lot as the body’s demand varies. Cushing’s affected dogs have a permanent overproduction of Cortisol due to a tumor in either the pituitary gland or the adrenal gland/s. Classic symptoms of Cushing’s disease are hair loss, a pot-belly, increased appetite, panting, and excessive water intake and urination. The disease is more often seen in older dogs and in smaller breeds of dogs (Cushing’s is rather rare in cats). After diagnosing Mac with this disease, his owner and Kathrin discussed how to understand Mac’s disease, how we need to treat him with the appropriate medication and also how to manage other health issues that might be contributing to some of his symptoms. With a proper diagnosis (if needed Kathrin would have even done an ultrasound guided needle biopsy of the liver to rule out other reasons for liver disease) and ongoing treatment, the symptoms are many times controllable. But it is important that the owner understands the treatment and the vet formulates a long-term care plan. There is a couple of medications for treatment of Cushing’s disease and it can be tricky to get the “fine-tuning” right – also without causing the opposite disease, which is called Addison’s Disease. For some cases surgical removal of the adrenal gland/s might be an option to consider. All treatment plans have pros and cons. The final decision is a close collaboration between the owner and the vet with regards to the treatment plan, the cost, and the expected response to the treatment as well as the individual pet and their specific health problems. Mac will need to have regular checkups to manage his health appropriately but we expect him to live well with his disease. Also knowing that his mum is taking the very best care of him!